Our beautiful beachfront condo is only 15 minutes from Cancun Airport and a 25 minute drive to Playa Del Carmen. The condo is on the first floor and faces the ocean. 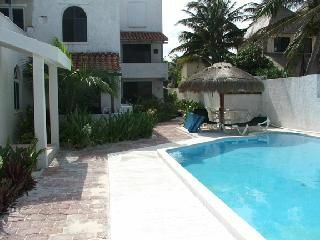 It has 2 bedrooms, 2 full baths, a totally equipped kitchen and charming Mexican decor. Our peacefull condo is in a small building with only 5 other units. We have air conditioners and ceiling fans in each room; satellite dish TV and internet connection; Laundry room just outside front door; once a week maid services, additional maid services are available on request. A BBQ grill is also available. This wonderful quiet getaway spot has lots of privacy and is just a few steps away from the swimming pool and ocean. Get away from your hectic life in this peaceful slice of Paradise! The condo managers are lovely people, and will help you with all your needs. Puerto Morelos is an undiscovered treasure. If you love tranquility, open skies, long stretches of beach and a small town atmosphere, this is the place for you. It is quiet—unlike the hustle and bustle of the hotel zone in Cancun. This sleepy fishing village is also a mecca for snorkeling, diving, and deep sea fishing. PM has an abundance of great restaurants, shopping and local color. There are also a number of small markets around the square and a full service supermarket just off the 307 highway; and wonderful book store. The towns residents are friendly and accomodating. Booking jungle tours, excursions to Tulum’s and Chichen Itzel Mayan Ruins, water parks where you can swimwith dolphins are all available in town. Be sure to spend sometime in the town square. It’s a great place to make new friends, and is truly magic at night. The town has just three principal streets and you can walk from one end to the other in about 20 minutes. PM’s close proximity to the airport and bus terminals makes it a perfect base for exploring the Yucatan peninsula. Playa del Carmen, just a twenty-minute drive away offers night clubs, cafes, and outrageous shopping. Our group of 4 stayed at Casa Del Mar #4 (ground floor unit) from Jan 21-29, 2019. The Unit was clean and cool upon our arrival. Other reviews mentioned the sounds from the washer/dryer conveniently located just steps from the door, but we didn’t notice that. The pool and grounds were beautifully maintained by Tomas the caretaker. Tomas was also helpful with any concerns we had. The kitchen was well stocked with pots, pans and utensils. We love to cook, and prepared most meals at the condo. I would have appreciated real wine glasses and plates rather than the plastic ones provided. The owner, Steve Snyder was quick to reply to all communication that we had. We would definitely stay at Casa Del Mar #4 again. Great condo and good location...private pool and quiet beach...having a car is very helpful but it is walkable to town by "beach" route. The owner of #4 unit was very helpful on a few issues that occurred during our stay. My family loved the condo. The kitchen was well equipped and the decor was cute. We loved swimming in the evenings in the clean pool. The showers worked as intended and so did the AC. There is Direct TV and the TV's are up to date and working. Condo was very nice, fully equipped and lovely. The grounds and pool are nicely maintained by Tomas who lives onsite and helped with anything we needed. But really, there’s nothing better than your own private white sand beach - simply amazing! The condo is about 30 minute walk from town, so a car, a bike, or lots of cab rides are required but the peace and quiet and private beach were worth it! Great condo right on the beach! Easy to find and far enough away from the all-inclusive hotels for a tranquil and relaxing stay. We only used one bedroom, and the bed was comfortable. Plenty of space to put your clothes. The air conditioner works well, along with the ceiling fans. Very, very clean! Big refrigerator and gas stove/oven. The kitchen was well stocked with many utensils. If you enjoy cooking, this place will work for you. A big bottle of filtered water lasted most of the stay. The Dish television and WiFi worked great! There are two large supermarkets on the main highway that I purchased basic groceries. Went to Aki, which had better ratings, but it was still the basics. The taxi guy dropped me off and actually waited for me to take me back. I gave time 300 pesos for his time and trouble. He seemed very happy with it. The next day we asked him to pick us up and take us to Croco Cun zoo, and again he waited and dropped us off downtown after the tour. He charged 300 pesos. Nice beach right out back. Plenty of beach chairs and beach towels. We were approached by at least a dozen beach walkers wanting to know more about the property and price. We directed everyone to VRBO. We didn't use the pool as it was a little too cool and windy outside. But, it looked very clean and well maintained. There are 2 bathrooms. The master bath has fair water pressure. The smaller bath had less pressure. There is a shared washer and dryer right outside the entrance door. Worked well and we used it a few times. The noise from the laundry took a little getting used to, and most folks were thoughtful and didn't start a load until the morning. Lots of nice, quiet people renting here. This is a very good place if you have your own car, take taxi cabs or enjoy walking a lot. There is a phone right outside of the entrance door that you use to call a cab. They know the place well. It takes about 10 minutes for the cab to arrive. Most cabbies charge 60 pesos. If you find a cabbie you like and trust (most), get his card and call him directly. There is also the option to rent a bike for a few hours or days from the town center. I'd consider this place senior friendly. No stairs. Walk-in showers. Marble floor in shower very slippery. Steve, the owner was very helpful and all communications were professional with great customer service. We want to stay here again. Thanks to Steve for providing his place as a vacation rental. Much appreciated! Joan, thank you so much for your review. Really glad you enjoyed your stay. Look forward to you returning in the future. Everything was great.. will be returning..
Casa Del Mar condo #4, first floor condo, one of 6. 1.2 miles from town square. 20 minutes from Cancun and 20 minutes from Playa Del Carmen. Weekly from $800 to $1450 Summer: May 16 to September 14 : $800. Fall: September 15 to November 15: $900 Fall High: November 16 to December 16: $950 Holiday; December 17 to January 6: $1450 Winter High: January 7 to March 16: $950 Spring: March 17 to May 15: $950 Fee policy: 50% deposit due at time of booking, Balance due 60 days from arrival date. Cancellation of reservation will result in loss of deposit. .